John Travis served in the Rockford Rifles as a part of the Illinois 45th Regiment. It was Travis’s job as the Commissary Sergeant to make sure the soldiers had enough rations and supplies. But Travis took his job further and would run food and coffee to the men on the front lines. He also assisted in the dangerous job of pulling the injured from the battlefield. John died in February of 1862 during the Battle of Fort Donelson in Tennessee. His death would be the first of too many men from Winnebago County that fell during the terrible war. His body was pulled from the battlefield and hurriedly buried there in the hills of Tennessee. But unlike others that would fall in the war, his body did not stay in that faraway place. A friend of John’s, Mr. Israel Sovereign, decided that he would make it his quest to bring John Travis’s body home to Rockford. He overcame near impossible obstacles to reach the battlefield where John was buried. He removed the body and brought it all the way back here to be buried where his friends and family could honor him. It speaks volumes to the level of respect and admiration that people held for Travis that anyone would make such a dangerous trek into the heart of the war. Rockford’s role in the Civil War is made up of hundreds of small stories such as John Travis’s. One story that takes place on the same battlefields as John’s was written about in an article on February 27, 1862. It is the story of a group of volunteers who left Rockford and traveled to the Fort Donelson battlefield. This group consisted of several doctors and other civilians. They traveled by train to Cairo, Illinois where they boarded the steamer Memphis. The article told of the difficult trip and of the horror the group felt as their neared the battlefield. When the volunteers finally arrived in the Fort Donelson area, they were greeted by Major Nevius who warned the group that the fighting had been fierce and they must prepare themselves for what they were about to view. Of course, all were still shocked and appalled as they were led into the hospital. They saw hundreds of injured men “cut to pieces in every conceivable way.” Their shock turned into despair as they began their bloody work. Two of the group, Dr. Richings and Dr. Strong, would spend over six straight hours amputating and dressing the limbs of the wounded from the battle. The next morning Major Nevius took them onto the battlefield where even more dreadful sights awaited them. “On rising the hill the realities of the horrors of war burst upon them with all their force.” Mangled and rotting corpses of men and horses from both sides of the battle lay in all directions. They made their way through the appalling scene to the camp of Major Melancthon Smith and the rest of the Rockford boys who were touched to see someone from home. They all expressed their gratitude to the group and to the citizens of Rockford who had sent them. The men spent some time visiting with the survivors of the battle and were saddened to hear the news of the death of John Travis. As the burial crews moved onto the battlefield to begin their grisly work, the volunteers from Rockford rode away. Their next stop was the steam ship City of Memphis. The ship was being used as a hospital and on the decks lay over 300 wounded men. As the group made their way onto the ship through the wounded, they could tell that the majority of the boys would not recover from their wounds. But to their credit, they did not hesitate to assist in any way they could. Again Doctors Richings and Strong helped with amputations and other surgeries. They expressed surprise when they were introduced to General Grant who had come aboard to check on the conditions of “his boys” as he referred to them. After several agonizing hours the men left to return to the camp. They collected letters that the Rockford boys had written to their families back home and then once again headed to the battlefield to work on the wounded. The men left after another day of operating on the wounds of the soldiers. According to the newspaper, this was the first time such a group was sent to the front lines of battle to assist the wounded. Unfortunately, the opportunity for this service would arise again. 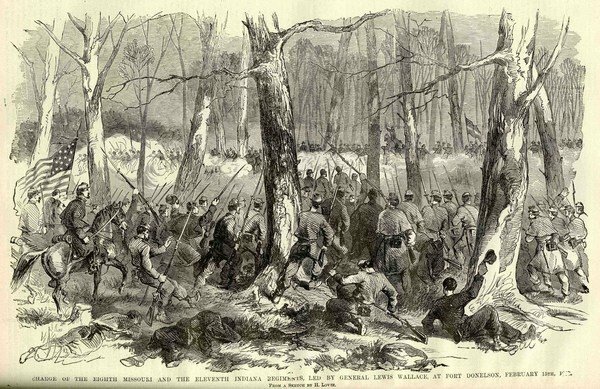 Though the Union victory at Fort Donelson gave people hope that the war would soon be over, it would rage on for another three years and claim many more Rockford lives.